There are a few questions I can count on when I do forgiveness workshops, whether I am working with church parishioners, teens or women in jail. One is, “Do I have to tell wrongdoers I forgive them?” Despite a genuine desire for forgiveness, there’s a part of us that wants to keep them on the hook. Resentment is such a powerful idea, we want the ones who did us wrong to think they’re under a cloud of resentment even if they’re not. One of the reasons forgiveness is difficult, and there are many, is that our sense of justice craves accountability. People should be held accountable for their bad deeds. If no one else is holding my wrongdoer to account, if it appears she is waltzing off scot free, then forgiveness challenges my sense of justice. I may feel I deserve release from my own poisonous resentment, but he doesn’t deserve to be forgiven. I may want retribution for him but restoration for me. Wrath—vengeful anger with a claim to retribution—is one of the seven deadly sins. It’s what happens when our natural desire for justice veers towards retribution rather than restoration. The spiritual disciplines of engagement and abstinence that bring our desire for justice into alignment with God’s will are fellowship and solitude. In fellowship, we discover, are annoyed by, and eventually appreciate the great diversity of gifts and graces possessed by fellow souls. Befriending others sustains the community, which in turn, sustains us. The mutual care is an antidote against by-standing when justice demands we take a stand. Moreover, when we endure irritations and aggravations, we discover just how nourishing the tokens of relationship can be—not despite our failings, but because of them, because God is present there. In solitude, retreat from people allows us to appreciate them in new ways and to consider whether we treat them right or love them enough. Retreat from secular influences and responsibilities inclines us to prioritize God’s will. Creating space for solitude affords a perspective that reveals the primacy of relationship, though fraught with human frailties, because God is present there. Reconciliation—whether between people, between groups of people, or within oneself—requires surrendering attachments in order to restore relationship. Our most persistent attachments are our ideas about our own identity, but we can also have powerful attachments to anger and resentment, to ideas about who deserves what and to particular behavior patterns. Anyone who has tried salvaging a relationship with an addict can attest to the wreckage visited on relationships due to the inability to surrender attachments to drugs or alcohol. 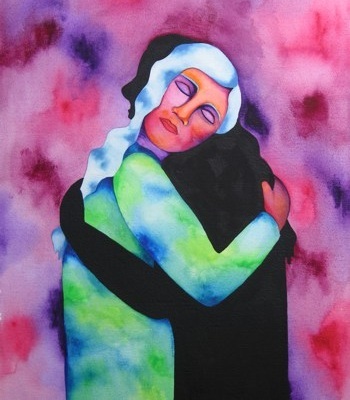 When I search myself in preparation for the sacrament of reconciliation with God, I find ideas about myself that are past their expiration date. They’re tough to surrender, even after I see they’re obstacles to my relationship with God and my own inner peace. It takes spiritual conditioning to be able to recognize the primacy of relationship and, moreover, to have the spiritual fortitude to surrender attachments that get in the way. The spiritual practices of fellowship and solitude can strengthen our spiritual condition. Join the conversation. What steers your conceptualization of justice towards retribution or towards restoration? This entry was posted in Spiritual Practices, Spirituality and tagged fellowship, Forgiveness, reconciliation, resentment, seven deadly sins, solitude, spiritual conditioning, spiritual disciplines, wrath by Stephanie Walker. Bookmark the permalink. Many thanks for the kind words. They’re especially meaningful coming from one who writes as beautifully as you do. Peace be yours. Neglecting our family, such as being unwilling to follow through on relationships, courtesies, and concern for family members. Avoiding working through conflict. Procrastinating when we do not find immediate payoffs. Living in a dream world. Avoiding social obligations or becoming busy with irrelevant tasks in order to avoid important commitments. Spending an inordinate amount of time on rest, recreation, television, reading, etc. Always looking for easy answers and shortcuts to solutions. Putting pleasure above all else. Not assuming responsibility for our work by wasting time,… producing inadequate work, not meeting deadlines, or leaving our tasks for others to complete.Avoiding spiritual growth. Ignoring the needs and concerns of our employees. Not treating people of lesser means with dignity and being unwilling to go out of our way to accommodate those in need. Lacking concern for injustice done to others. Being unwilling to undergo hardships without complaining….Failing to fulfill spiritual and religious obligations, such as attending church regularly.